He acknowledges that local and “hyperlocal” online have grown up to replace, or to compete with, the embattled papers. But their resources are slender and success is patchy. Can the grassroots of journalism be fertilised so they grow quicker and stronger? Moore thinks they can and in laying out his case takes a swipe at the (present coalition) government’s plan for local TV channels as the answer to the problem. There are better, richer opportunities for online local news services using cheap and increasingly powerful software, particularly for crunching data which is starting to emerge from public authorities. Moore cites American examples of sites and applications which help people with everything from neighbourhood safety to data-driven accountability. (I particularly like philosopher-wisdom ring of the pro-transparency site called Socrata). The difference between the US and the UK is the relative weakness of British philanthropic foundations (and perhaps their lack of interest in this issue) and the fact that the Charity Commission in the UK does not consider support for journalism a charitable purpose. Small community news startups cannot constitute themselves as charities and enjoy the financial advantages of the status. Moore concludes that the best way of kickstarting more vigorous innovation would be a funding contest on the lines of the Knight News Challenge in America. In short, it’s a call to foundations to spend a little money buying people spaghetti to throw at the wall and see what sticks. 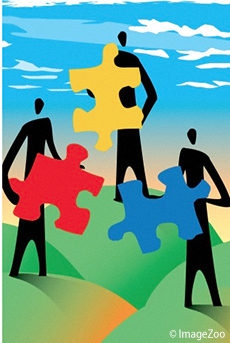 Communities are made, when they succeed, from many different kinds and bits of glue. Anette Novak of the Sweden’s Interactive Institute wants journalists to see themselves as “society builders” – which I fear encourages journalists to distract themselves by becoming politicians. The building today’s journalists need to do is the building of new tools and new skills to provide value to their fellow citizens in a radically-changed information world. Useful facts discovered and distilled by journalists and others which fuels debate and accountability is one kind of glue which holds a community together. And it requires more attention than it’s getting. *Update 22/10/14: here is Sheila Coronel of Columbia asking if this might be investigative journalism’s golden age. This entry was posted on Monday, October 20th, 2014 at 9:12 am	and is filed under Engagement, Experiments, Local, Media Economics, UK Press. You can follow any comments to this entry through the RSS 2.0 feed. Both comments and pings are currently closed.